A list of my top clean, nontoxic skincare, haircare, and body care products for those looking to go more natural with their beauty routines. These are the non-toxic beauty products I keep in my bathroom. Ever since I learned about my gene mutation that leaves me at higher risk of breast cancer, and especially now that I’m pregnant and looking for safer options for me and baby, I’ve been switching over my beauty products to more natural, non-toxic versions. I mean, I try to put good things into my body, why should what I put on my body be any different? I’ll admit that I thought people who bought all natural everything were a bit silly and wasting their money for a while. I mean, when you’re in college and broke, the $3 shampoo is a pretty good option, right? Shelling out money for hippy-dippy deodorant that didn’t work and left me stinky and poor was not my top priority. But after reading the effects of some of the chemicals in everyday products like face wash and lip balm, I’ve come around to cleaning up my beauty routine. I don’t necessarily believe everything I read – y’all know I like to have the scientific facts. But the truth is, I don’t have a ton of time to find good research on every ingredient in every product I buy, and I’m sure you don’t either. Between a predisposition to breast cancer (one that is easily affected by hormones) and trying to start a family, I figured it wouldn’t hurt to eliminate any risks that I can control early on. True Botanicals Clear Trio Y’all. This cleanser, toner, and facial oil combination truly changed my life. I was so nervous to switch to a natural face wash because I my acne-prone skin. But this stuff truly works miracles, even on my terribly hormonal, temperamental pregnancy skin. And it smells amazing. I know it’s pricey, but this is the one splurge that is totally worth it to me (although I probably wouldn’t buy it if I were still a grad student). I seriously can’t say enough good things about these products. They also have lines for normal and dry skin that I hear excellent things about. Franklin and Whitman Midtown Village Face Scrub Love this company’s products! The Midtown Village Face Scrub smells heavenly and leaves my face feeling super soft. I also love that they donate a portion of their profits to dog rescue organizations. They have specials fairly frequently, so it’s generally pretty easy to get products for up to 40% off. BeautyCounter Charcoal Cleansing Bar I love this cleansing bar for taking off makeup and balancing my oily skin. I keep it in the shower for easy cleansing on my face/chest/back. BeautyCounter Balancing + Charcoal Facial Mask This charcoal mask is amazing. I use it about once a week to draw the junk out of my pores (which tend to get clogged easily). And it smells SO good. Herbivore Botanicals Blue Tansy Resurfacing Clarity Mask I love this mask for taming redness and helping to clear breakouts. It’s so soothing, and it goes on clear, so you don’t scare anyone when you’re wearing it! (Use this link to get 20% off your first order at Herbivore Botanicals). True Botanicals Clear Cellular Repair Serum This serum really helps to clear up my skin when it’s acting up particularly bad. I can feel it working on breakouts immediately. They also have an Anti Aging Serum that I use with the Vitamin C Booster once a week to help with some discoloration from acne scars and pregnancy. Herbivore Botanicals All Natural Coconut Milk Bath Soak My sister bought me this bath soak and I am seriously obsessed. Not only does it smell amazing, but it leaves my skin so soft and smooth after I use it. LOVE! Meant Simply Wonder Polish I love this body scrub. It’s super moisturizing and smells like coffee and grapefruit – two of my favorites! Meant is all about minimalizing your beauty routine, so their products are multi-tasking, which is pretty awesome. Dr. Bronner’s Pure Castile Liquid Soap I’ve actually been using this soap forever because I love the smell. Again, I was using lavender, but switched to the peppermint when pregnancy messed with my sense of smell. One bottle goes such a long way and can be super multipurpose, though I mainly just use it in the shower. Bonus – you can get it on Amazon or at Sprouts, and I’ve ever seen it at Coscto! Franklin and Whitman East Falls Body Serum I love the smell of this so much, and it makes my skin super soft. I’ve been rubbing it on my belly after I get out of the shower lately. Meant Simply Absolute Balm This is another great one for moisturizing. The oil balm-turned- serum smells amazing (more grapefruit!) and leaves my skin feeling soft and refreshed. It’s also great for a moisturizing hair mask! True Botanicals Pure Radiance Body Oil I absolutely love this body oil. It smells SO good in an earthy way, and leaves my skin super soft but not greasy. Inkling Scents in Sultry and Rose I’m obsessed with these fragrance oils. Even though I don’t leave the house much during the week since I work from home, I still like to smell good. Inkling scents are made with 100% essential oils and perfume oils so they’re gentle on sensitive skin. The smell lasts all day and is just heavenly. Meant Simply Do-All Wash Shampoo and Conditioner Meant makes a multitasking line of shampoo and conditioner that also serve as body wash, shave cream, etc. They’re perfect for females and males who like to have all-in-one products in the shower. They’re completely free of parabens, sulfates, phthalates, propylene glycol, TEA, DEA, mineral oil, silicones, synthetic dyes or fragrances. I love the way the shampoo and conditioner smell, and they work great. I feel like my hair really gets clean and is soft and moisturized once I hop out of the shower. Giovanni Organic Styling Mist Hair Spritz I figured hairspray was going to be a tough one to find that was both clean and actually worked. This one works well with a nice spray stream that’s more like a mist instead of “squirty” like some organic hairspray nozzles. That’s it on my top clean beauty must-haves for now. I hope to come up with my favorite clean makeup essentials for you in the near future. I will be updating this post as I find more amazing products, and I’d love to hear what works for you! What are your top clean beauty must-haves? 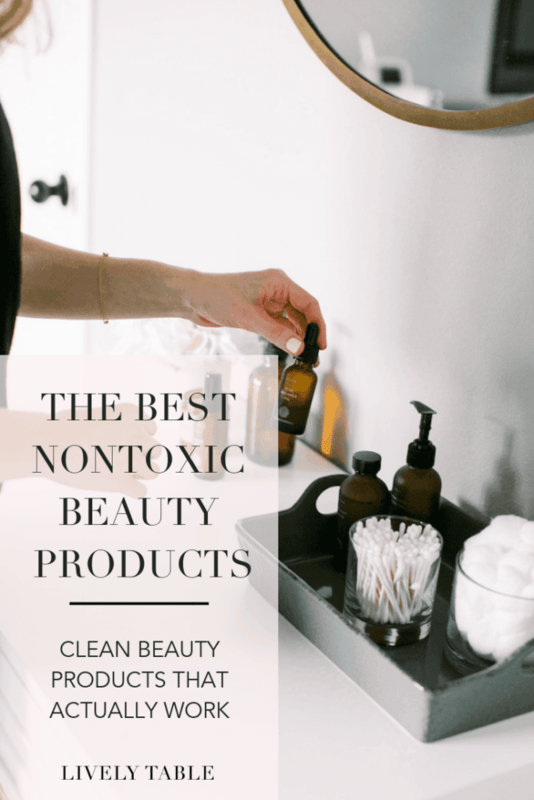 For more of my clean beauty favorites, take a look at my favorite non-toxic makeup! This page may contain affiliate links, which means I earn a small commission at no extra cost to you. I only recommend products that I truly love and use at home! Love, love, LOVE!! Thank you for this post. I found it so helpful and relatable. I’m currently in the process of switching to clean products and have been feeling overwhelmed! I was wondering if you have any suggestions for clean makeup products?! Thank you!! So glad you found this post helpful! I hope to do a makeup roundup, but for now I’m loving alima pure makeup! Thanks for this post! It’s quite timely as I’ve been researching new natural deodorants. I love Tom’s but also feel let down by it some days when I have break-through stress sweat. I understand that with natural comes a higher cost, but I’m hesitant to purchase Primally Pure because of it being $12 for a small bottle. I did look on Amazon and couldn’t find it listed. Did you purchase directly from their website? Thanks for writing such a detailed post! I bought it straight from their website. I find that it lasts quite a long time so the price doesn’t bother me, and it’s not as expensive as some natural options. I definitely was not a fan of Tom’s deodorant! Thank you! I’ll give it a shot! Glad I’m not the only one because I thought maybe I just had issues, ha! I do have quite a bit left that I’ll need to use from time-to-time. I know lavender has bothered you due to pregnancy, but is it a nice scent?